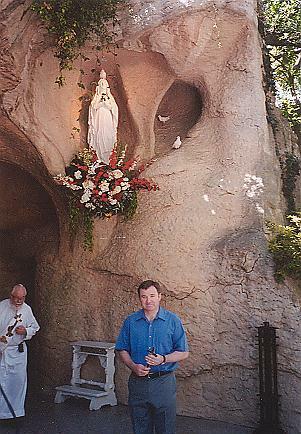 While visionary [Carver Alan Ames] was in the United States he gave a talk at the Lourdes Grotto in San Antonio, Texas, on Trinity Sunday, June 10, 2001. There was a marvelous occurrence three white doves came to visit and stayed for some time. 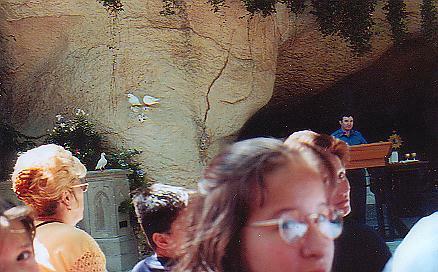 The Doves of this Trinity Sunday of 2001 were captured photographically and are shown here for all to see.The three doves appeared at the commencement of Alan's talk and stayed around while he was talking, leaving only at the end of the healing session.The three doves can be seen here, one on top of the head of Our Lady's statue and two in the hollow to the right. They flew away at the end of the healing session after Alan's talk. See [here] miraculous photo. Crucifix which Alan Ames uses during his healing prayer sessions clearly shows blood oozing from the Crown of Thorns around the head of Jesus.